The Matrix or ‘How it all came together’. Since the 90’s boom of intelligent animation, Aladdin, Toy Story, Nightmare Before Christmas etc, western film-makers have realised that you don’t have to aim cartoons/animations solely at kids, the grown-ups can be included in a way that doesn’t alienate the little ‘uns (of course the Japanese have known this for years). Finally, the west have realised that a family film can be just that, for all the family, not something the adults have to sit through so little Timmy/Tammy can have their fun. Sure, there are still plenty of films out there that don’t have this remit but every now and then a film comes out that is just downright entertaining across the board of ages. Happy, happy, joy, joy. The last film like this was Wreck It Ralph, a well thought out animation that had story and character at the top of its priorities. Like Ralph, The Lego Movie is a joy. Similarly, a well constructed story with 3 dimensional characters as key. The hero’s journey has several stages and pretty much all are followed here. They say there are only seven basic plots and the adhering to one or more of these combined will result in a well structured story. 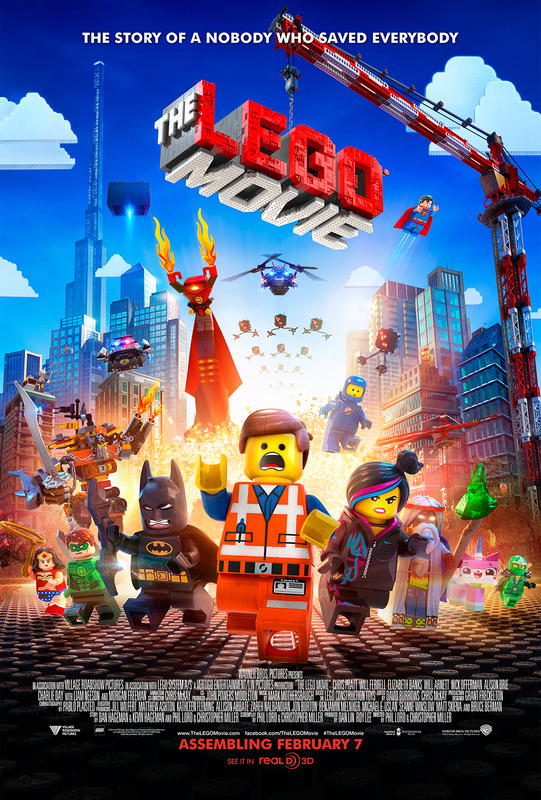 What directors/writers Phil Lord and Christopher Miller have achieved with this fantastic piece of storytelling is incredible; the metaphors for life using the wonderful world of Lego come in thick and fast and also manage to be very funny. Clever, astute and paying perfect tribute to these famous plastic bricks and all they represent to both kids and adults. Without mentioning the word Lego once in the whole film, Lord and Miller make a wonderful statement about the power of imagination both inside and out of the box. The voice cast is a dream, Chris Pratt (recently in Her and soon to be seen as one of the Guardians of the Galaxy) is our protagonist, Emmet, an average construction worker, happy to be just fitting in and playing along with societies rules until the day he finds the piece of resistance (see what they did there?). He finds himself thrust into a world he had previously no knowledge of, becoming extraordinary in the process and also, possible saviour of the Lego world. There is the perfect blend of innocence and everyman in his voice work and he pitches it perfectly. Will Ferrell is brilliant as the evil Dr Business (best baddies’ name since Dr Evil). The ever-talented Elizabeth Banks plays the love interest WyldStyle and, unlike most love interests in Hollywood, really gets to have a journey. Will Arnett is Batman, giving his best in rasp and creating a spoilt, selfish and very funny Batman. Allison Brie (Community) is making her mark in the world outside television, here playing the always positive Unikitty and gets one of the best moments in the film. Morgan Freeman is the Moses/Morpheus-a-like and has some great lines. Also starring, Dave Franco, Charlie Day, Will Forte, Channing Tatum and Jonah Hill (as Superman and The Green Lantern with a wonderful recurring joke) and the irrepressible Nick Offerman as ye olde pirate, Metal Beard is very funny. This is the kind of film you should be showing your kids. The message is to find your element and run with it. More of these kinds of films please, filled with love of story and life lessons for the little ‘uns and the grown ups too. The Lego Movie over a bunch of Despicable Me types any day of the week.